The Broadway corridor is undergoing a massive improvement project, as seen here where it meets Alamitos. Photo by Brian Addison. The massive overhaul of the Broadway corridor is a project I have long heralded, along with its sister project in Downtown. After all, I’ve been walking from Bluff Heights to Downtown and back several days a week for over a decade—and we’re talking the entire renovation of a key corridor that is not only important in terms of accessibility but culturally rich: Pegged by Bixby Park on the east and DTLB on the west, dotted in the middle with Long Beach’s core gay watering holes, it is important that this street reflect what it values most—and that is the people who’ve created it, the people who make it their home, and the people who make Long Beach, well, Long Beach. So where are the trees, those bits of natural wonder that provide color, shade, and clean up our air from the constant flow of vehicle emissions? This isn’t a joke of a question but a legitimate concern: Greenscaping has completely gone amiss on the stretch of road as more and more work gets done—and even more concerning are the expanses of concrete sidewalks with absolutely zero tree wells. 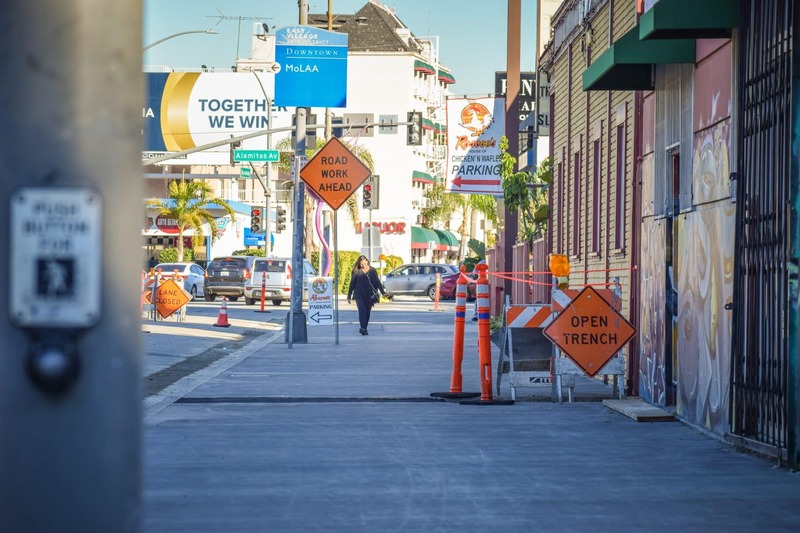 In fact, Public Works admits this: While the ficus trees ripped out near Broadway and Cherry will be replaced, they will be placed in other locations along the corridor rather than their original spaces (hence the lack of new tree wells). After that, there are “no plans to add additional greenscape or irrigation along the corridor,” according to Public Works Executive Assistant Jennifer Carey. In contrast to Broadway, First Street’s stretch in Downtown’s East Village is filled with green. Photo by Brian Addison. Carey also noted that the focus was on the bike network, creating an overall safer street for both drivers and pedestrians, and improve ADA compliance—all of which I very much understand, especially replacing ficus trees with much more city-friendly saplings. But the lack of any greenscaping along one of the city’s most used corridors is not only flat-out ugly—exorbitant sidewalk space with no pedestrian amenities or greenery is nothing more than a concrete expanse; and the fact that many areas have no tree wells created means that if we want them in the future, it will be a pretty penny—but it’s counterintuitive to the city’s much-lauded Climate Action Adaptation Plan. On top of this, the trees replacement ratio is cheap: If you have to remove trees that are decades old because they’re damaging sidewalks, replace the tree with two more because it’s possible; not one because that’s just uninspiring no matter how you dice it. Be aggressive about greenery in our city, not setting our past as the standard because Broadway needs helps when it comes to pollution (as does Anaheim, which is also a corridor that lacks greenscaping). In fact, Broadway ranks in some of the most pollution-burdened areas from the 710 (where it is the worst) all the way to Junipero, where easterly, Broadway finally achieves an area where there is a CalEnviron score where less than half of the population is exposed to harmful pollution and less than half of the population consists of those most at-risk (e.g. children). And yes, trees will help offset these burdens—just like the mulch barrier built along the Terminal Island Freeway in West Long Beach has decreased air pollution for kids at Hudson Park. Do better, dammit. Be greener. 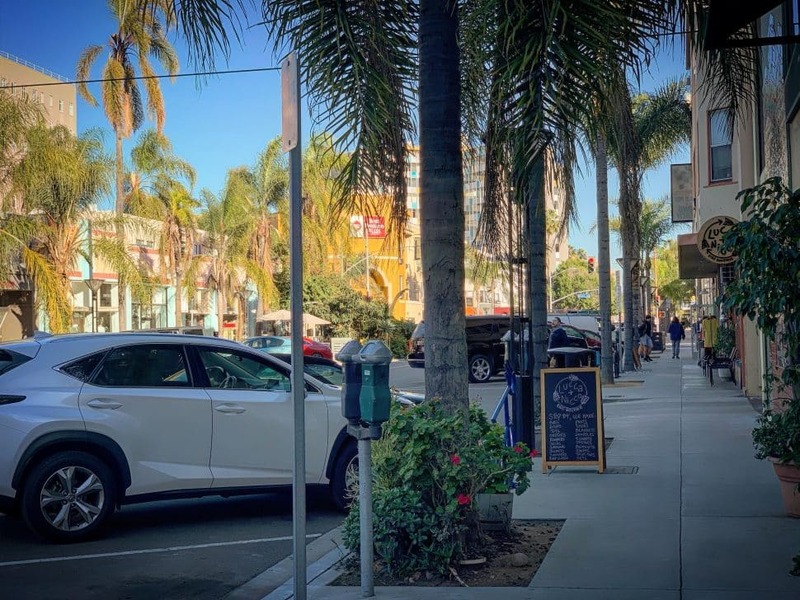 Editor’s note: This article originally stated that trees would only be replaced on Broadway between Golden Avenue and Alamitos Avenue; this has been corrected.